A joint team of the Institute of Vertebrate Paleontology and Paleoanthropology (IVPP), Chinese Academy of Sciences, and the Gansu Provincial Institute of Archaeology found a new paleolithic site at Xujiacheng village, Wanquan Town, Zhuanglang County, Gansu Province on June 29, 2009, and excavation was carried out later on in an area of about 15m2. The Xujiacheng paleolithic site was buried in the Malan Loess overlying the second terrace of the Shuiluo River. Nine stratigraphic layers were identified, with total thickness of more than 6.5m. Four cultural layers were identified and more than 5500 stone artifacts and 550 fossils were unearthed. Researchers reported their findings in the latest issue of Acta Anthropologica Sinica 2012 (3). Archaeological materials were mainly unearthed from the 4th and 5th layers of the Xujiacheng paleolithic site. The stone assemblage included manuports (N=385), cores (N=140), flakes (N=1341), chunks (N=688), debris (N=2689) and retouched tools (N=176). The stone artifacts from four different cultural layers showed roughly similar features. 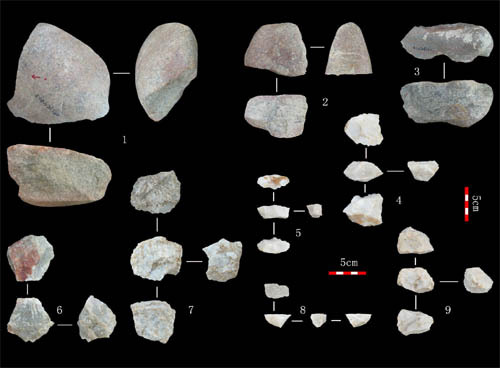 Lithic materials exploited at the site were locally available from the ancient riverbed with more than eight kinds of raw materials utilized in core reduction and tool manufacture. They are granite, quartz, conglomerate, diorite, marble, quartzite, gabbro and amphibolite. Quartz and granite were the dominant raw materials used for producing stone artifacts at this site. The principal flaking technique was direct hammer percussion without core preparation, and occasional use of bipolar technique. Most stone artifacts were small and medium in size. Only five types of retouched tools were identified, namely side scrapers, points, drills, choppers, and notches. Denticulates, endscraper, drill scrapers, notched scrapers may have existed. Major blanks for tools were flakes, followed by chunks, and pebble blanks were rare. Based on stratigraphic observations and AMS14C dating, researchers suggested that the main cultural layers of this site are formed about 36000-43000 years ago. 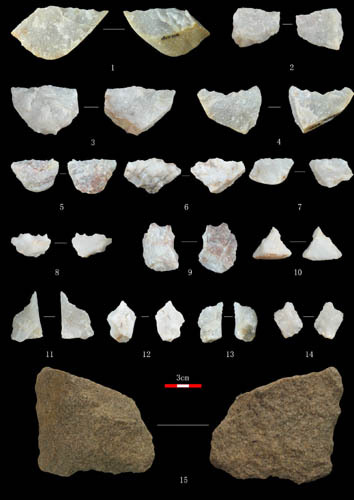 “The stone tool assemblage of this site shows close ties with the Flake Tool Industry (Main Industry) of North China. It provides new materials to discuss human adaptive behavior, migration, and interaction with environment in this area”, said first author LI Feng of the IVPP. This work was supported by CAS Stategic Priority Research Program, National Natural Science Foundation of China, and Basic Research Projects of MST of China.